If you go about your everyday life and take the time to observe hair loss patterns in men, you'll notice that most men have some degree of frontal hair loss and temple hair loss. While making this observation, you'll notice that it is almost a rarity to see men with no frontal hair loss at all. Frontal hair loss is first identified by men as a receding of the hair line in the front (above the forehead) or the temple regions (the flat space on either side). When examining your own temple regions, look for hair that appears smaller in density, "weaker," almost like "fuzz." This is hair that is being attacked by DHT, the main cause of genetic hair loss in men. 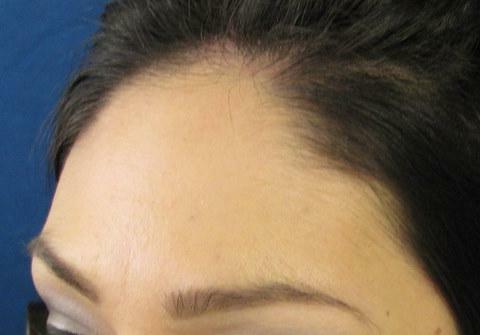 Another application of only frontal hair transplant is hair restoration for transgenders. Male to female trans gender is the most common type and transforming a male hairline to a female one is one of the priorities in this process. Hair transplantation for transgender is an important procedure for transexual people and a hair transplant surgeon needs to understand the patient's facial proportions. 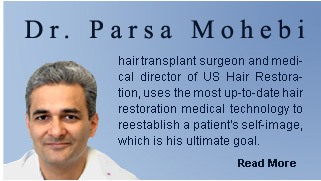 The Hair transplant surgeon must be experienced with re-shaping the hairline from male to female. Women hairline is different from male in many aspects such as: the location of the hairline from eyebrow level at mid frontal and laterals; temples need to be restored in a complete female shape; direction and orientation of hair shafts are also different between men and women. All these features and details of the patient face need to be dealt with closely by an experienced hair transplant surgeon.